It took the leaked release of the Deadpool test footage, and the enthusiastic fan response, before Fox finally decided to invest in a big screen, R-rated superhero movie. The result was 2016’s Deadpool, a huge smash and proof that a lucrative audience will turn out for more adult-oriented, outrageous, grisly versions of comic book movies. Because of Deadpool, we finally got an R-rated Logan that proved to be an outstanding swan song for Hugh Jackman’s iconic hero. Now Deadpool is getting the spotlight he has earned with a big, splashy summer release, but with success comes expectations. Can it live up to the ever-increasing hype? In short: if you were a fan of the original, you’ll be happy enough, because Deadpool 2 isn’t much more than the sum of its zany parts. Wade Wilson a.k.a. Deadpool (Ryan Reynolds) is killing bad guys for hire and considering starting a family with the love of his life, Vanessa (Morena Baccarin). Trouble emerges when Cable (Josh Brolin) travels from the future to kill a rebellious, troubled young mutant teenager, Russell (Julian Dennison), who will one day grow up to be a monstrous villain. Deadpool reaches out for help and forms an elite squad of determined heroes, notably the luck-assisted Domino (Zazie Beetz). Can Deadpool save the kid, save the day, save the future, and save himself from incessant fourth wall breaks? I was worried that a Deadpool sequel would fall into some of the same detractions that a Guardians of the Galaxy sequel did, and this is still applicable. Deadpool 2, much like the original 2014 Guardians film, was a breath of fresh air and a far looser, weirder, funkier super hero movie with a nose-thumbing, prankish attitude. We didn’t know what to expect from a Deadpool movie and now we do, and with that knowledge comes an anticipated formula of checklists to adhere to, and so any resulting sequel will invariably feel less fresh. It happened with Guardians of the Galaxy vol. 2 so to compensate James Gunn concentrated on fleshing out secondary characters into people you might shed a tear over. Deadpool 2 doesn’t bother because Deadpool 2 doesn’t take anything really seriously. That’s one of the hallmarks of the series and also one of the aspects that holds it back. There can never be a sense of stakes with a gleeful, fourth wall-breaking cartoon of a character who bounces back like Wile E. Coyote. The sequel introduces a sense of stakes with a startling turn in the first ten minutes of the movie, but by the end, even that will be corrected so that the Deadpool universe returns to stasis. The limitation of the Deadpool universe is that nothing feels meaningful or even ambitious. The movie wants to be a cheeky, transgressive good time and it achieves this single goal. The appeal of Deadpool 2 is still its comedic voice and unpredictability. The laughs will be frequent and there are some subversive and unexpected directions that fully take advantage of the R-rating and the anarchic, nasty comic spirit of the franchise. The formation of the X-Force team and how their first big mission plays out had me howling with laughter. The meta humor commenting on the nature of super hero movies, as well as the film industry in general, begins with the very opening image (a nod to another successful R-rated super hero movie of last year) until the very last moment where Deadpool goes back in time to prevent some stinging cinematic grievances (there is not post-end credit scene, so you can skedaddle early). This is clearly the role Reynolds feels a spiritual kindship with, and his caddish, charming, persistent persona makes the perfect conduit for the film’s vulgar insanity. Whether it’s spitting insults, splashing in over-the-top violence, or making odd observations about the similarities between the songs from Frozen and Yentl, Deadpool 2 is first and foremost a bloody, depraved meta comedy. Director David Leitch (Atomic Blonde) steps in for the departing original film’s director, Tim Miller, and continues his hot streak of stylish, action thrillers. Leitch has shown a propensity for staging intense action sequences to best showcase intricate choreography. With Deadpool 2, the most exciting moments are when the camera and editing allows the audience to fully appreciate the creativity of the choreography and stunt team. A shot of Cable leaping over the speeding caravan about to smash into him brings of a well-earned wow. Coming from that bruising world, I’m continually impressed with how Leitch approaches his action and finds organic points to develop and complicate matters. The prison caravan attack is the action peak with well-constructed, parallel lines of activity to follow and collaborate. It’s our first taste of Deadpool and X-Force versus the might of Cable. The characters enter the fray at different points and get separated from the runaway caravan, which keeps the momentum ongoing. While the comedy is prioritized, Deadpool 2 can still unleash enough exciting, silly, and satisfying action. 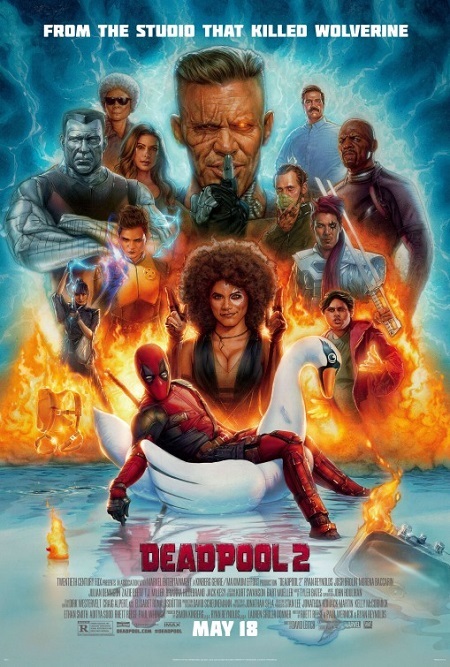 The biggest additions to the sequel are an adversary and an ally, and both leave a favorable impression while still making you wish that Deadpool 2 had done more with them. Brolin (Avengers: Infinity War) bulked up considerably to play the gruff cyborg from the future, and his super serious, macho straight man provides a terrific comic foil for Deadpool, much like the stuffy Colossus in the first film. Brolin’s character is a capable fighter with a pretty streamlined back-story (shades of Looper abound) but it’s hard not to feel a little disappointment with how he’s ultimately utilized. He’s a great asset that feels put away for too long. Zazie Beetz (TV’s Atlanta) has a fun introduction especially as it relates to her mutant power, great luck. Deadpool scoffs at this as a power, and “being deeply un-cinematic,” but Domino proves otherwise as she’s able to dodge split-second danger in grand, complicated, Final Destination-like circumstances. Every time she’s onscreen, Domino brings a curiosity quality to the movie, and it’s usually something imaginative and fun. Beetz has an innate spunky energy, which makes it sad when the movie often asks her to be dour and dismissive. It’s taking such a lively character and constricting what makes her amusing and unique. The biggest thing holding back the film, besides a general sense of “more of the same” or its inherent lack of stakes, is that the entire storyline is built around saving a mutant teen…. and I kind of hated the kid. My first impression was not good and it didn’t get much better from there. Part of it may be that Russell is meant to be an angry, obnoxious teenager, and maybe part of it is the generally grating performance from Dennison (Hunt for the Wilder People), but I could not care about this kid. Unfortunately, a lot of thematic emphasis is placed on saving the soul of this one annoying, wayward teenager. He’s supposed to be a point of redemption for Deadpool and a promise to be fulfilled, but my pal Ben Bailey came up with an instantly better revision. Instead of introducing this new teen character who will one day grow up into a super villain that slaughters Cable’s future family, why not have it be Negasonic Teenage Warhead (Brianna Hildebrand)? We already have an investment in her character and it would provide a better, more personal sense of stakes for the story. Plus, Hildebrand (Tragedy Girls) is a good actress. If you were one of the many fans who enjoyed the irreverent antics of the first Deadpool, then you’ll enjoy Deadpool 2 as it’s more or less the same movie with a slightly limited freshness date. These movies are fun, funny, and ridiculous, but they’re also good for little else than a wicked good time, and that’s okay. There isn’t much ambition to be anything more than an irreverent satire on super heroes with edgy humor and explosive violence. The running theme of the sequel questions what Deadpool has to keep on going, and he’s told it’s one very specific F-word: “family.” I think it’s a different F-word, namely “franchise.” Fox (Disney?) will need the services of the merc with the mouth for an extended engagement as long as audiences do not tire of the same studio brand of actually naughtiness reheated with a few different ingredients added per revisit.